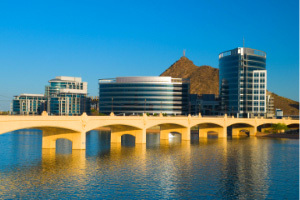 Tempe is packed with history, culture, shopping, dining, nightlife, and sports. Treat yourself to an ASU football game, go on a shopping spree at its many shopping centers, kayak on Tempe Town Lake, or simply lounge by the pool. Tempe is conveniently located just 10 minutes from Phoenix Sky Harbor International Airport, in the middle of the Phoenix metropolitan area. Tempe offers a variety of excellent dining choices throughout the valley. There is a diverse array of popular bars and nightclubs throughout the Tempe area. Tempe’s abundant sunshine delivers year-around enjoyment at a variety of local attractions.